Rev. 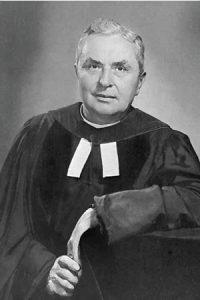 Dr. Howard Carman Scharfe served as the sixth head pastor of Shadyside Presbyterian Church from 1945 until his death in 1971. The Howard C. Scharfe Fellowship Endowment was established as a memorial to Dr. Scharfe by the congregation of Shadyside Presbyterian Church in thanksgiving for his pastoral leadership. To grant fellowships in amounts appropriate to the needs of individual recipients, including sums required for graduate study, either in the United States or abroad, by ordained ministers. The Howard C. Scharfe Fellowship Endowment shall be administered by the Session Committee on Adult Education. All proposals recommended by the Committee for funding must be approved by the Session. A completed Scharfe Fellowship Grant Application must be submitted to the Session Committee on Adult Education by April 15 for monies to be applied to the Summer/Fall term, or by October 31 for monies to be applied to the Spring/Winter term. The nature and content of the program. Some anticipated benefits to your current ministry that you expect to derive from participating in this full-time graduate program. The actual program, and an assessment of the experience. A plan for ways in which the applicant’s experience could be communicated to and, perhaps, enhance the faith-life of this congregation, including some projected examples of how one could accomplish such. The typical expenses for this endowment are intended for registration fees and tuition. All proposals recommended by the Session Committee on Adult Education for funding must be approved by the Session. All disbursements are subject to the discretion of the said Committees and their decision is final. To apply, download and complete the application form. Submit your completed materials to the church office.